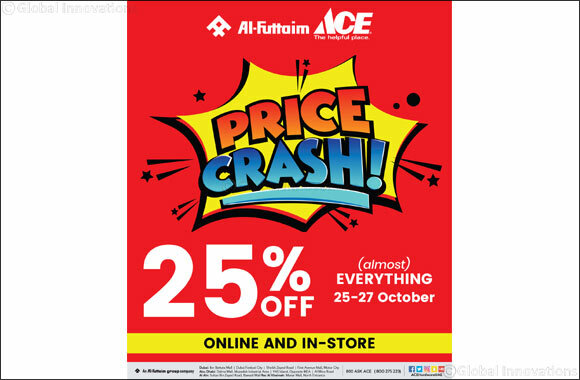 Dubai, October 27, 2018: Al-Futtaim ACE has a PRICE CRASH promotion with up to 25% off selected products, including Home, Outdoor Garden, Automotive, Paint, DIY and select pet products. There are also special offers for Diwali. Al-Futtaim ACE stores offer a wide selection of Outdoor Lifestyle, Gardening, Home Living, Paint & D�cor, DIY, Automotive and Pet care products. With more than 33,000 great products, Al-Futtaim ACE offers world-class brands such as WILKO, Karcher, Black & Decker, Makita, Clark + Kensington, Weber, Gardena and Leisuregrow. In addition, all stores also have a popular Value range which has a host of quality products at everyday low prices. Al-Futtaim ACE also offers a wide range of electronic and electrical product in association with Plug-Ins.